Everything you need to know about them is right there, humming on the surface: trippy, funny and melancholy, these are virtuoso hallucinations in a high-keyed palette – hot pinks, fluorescent orange and wild flashes of cerulean blue. Mosley’s canvases are populated by merry turncoats, bewildered mystics and mournful minstrels, all coming or going or mutating into something or someone else…Many of them appear to be searching for something, be it salvation, a god or a good time…Like outtakes from fairy tales, the works have a narrative thread buried deep beneath their surfaces, but if you are after a beginning, a middle and an end, then you are bound for disappointment; nothing so straightforward exists here. 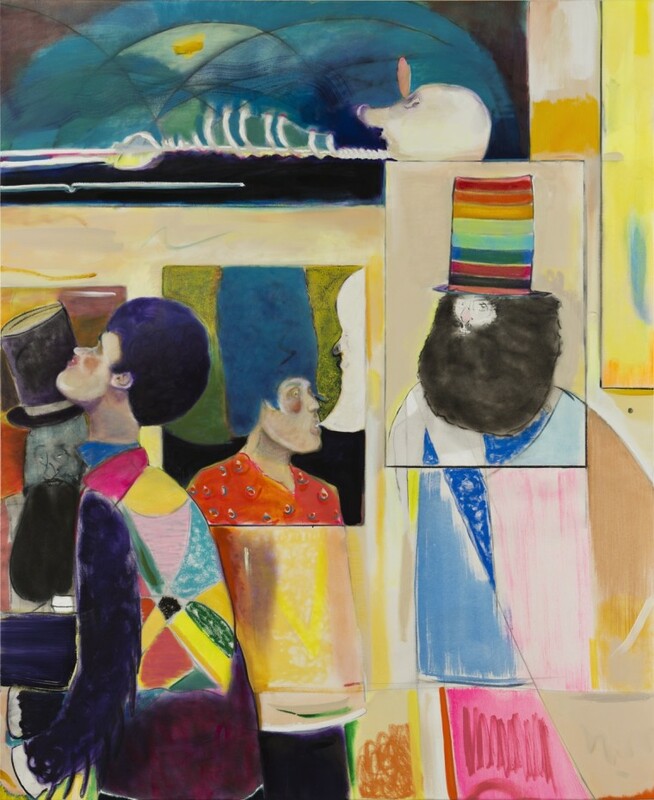 Alison Jacques Gallery is delighted to present Anatomy and the Wall, our fourth solo exhibition of new works by Ryan Mosley. In his new series of paintings, Mosley continues to develop and expand his imaginative world, taking his eclectic cast of characters on ever more fantastical journeys and presenting a world at once historic and yet decidedly of our time. The new large-scale works featured throughout the exhibition expand upon Mosley’s complex and sophisticated use of line and colour. His delicate layering of subtle hues of paint contributes to the surreal visual tales that appear throughout his complex compositions. This is a world where anything is possible, the smoke of a pipe morphs into the head of a figure, a bearded gentleman’s coat can transform from cloth to skin or the inside of a room. This visual dance between abstraction and figuration, and Mosley’s continued mastery of space and perspective transforms a seemingly surreal world into something utterly believable. Narrative strands snake and twist throughout the canvas inviting the viewer to take a step into Mosley’s smoke filled bars and peculiar playhouses that evoke the cornucopia of colourful artists, writers, and musicians that mingled with the glamorous dancers and shady characters of 19th century Montmartre, as well presenting a more hallucinogenic world of fantastical double humped beasts and fragmented landscapes. Mosley will also present a series of smaller more intimate portraits in which much of the picture frame is consumed. The characters in these works present themselves somewhere between a fictitious artists sitter, muse, hermit or learned thinker, appearing ready with a tale to tell. These works are more intimate in scale and presented here together, appear to be calling to each other in a game of Chinese whispers across the gallery wall. Incidental marks and motifs are gradually layered, each one leading the viewers gaze and allowing us to discover the protagonists, mysterious duchess like characters and femme fatales that inhabit Mosley’s fictional land. Mosley never has a specific idea as to what the end result of each painting will be, instead as his paintings evolve the characters that inhabit his lyrical worlds gradually emerge, each one steeped in a personal history.